The Chakra Therapy System was designed and given to Patrick and I in 1993 as our new service to humankind. In our health care practice our main goal was to educate people to know that it takes more than a pill to heal. We taught techniques to take control of your energy and move the body into health. As a child I would talk to the Celestials about the “lights” on people and they would teach me what these lights of energy were saying about a person. It has always been easy for me to see the energetic world and a challenge to comprehend the solid world. Many of the techniques taught to me by the Celestials are included in Energy Radiance, and I love to teach others how to play in energy. Our primary focus has always been to help people help themselves. Want to see more Chakra Therapy Systems? Check out our full inventory of Chakra Therapy Systems! Born clairvoyant, clairaudient, and with recall, Jaculin Dorman has always worked with subtle energies. Isolated in childhood by various physical restrictions including being legally blind, she was guided by and began working with the Celestial Realms when she was eight years old. In preparation for the present time, her youth was spent “playing with the angels,” and communicating with and understanding nature spirits and devas. Trained by the Celestial Realms, Jaculin teaches techniques to help Star Children discover who they are. In 1991, her mission of finding Star Children was expanded to assisting them in their purpose. It is a pleasure to see Star Children coming together in service. The time we have been waiting for is now. The work is a blessing, and to be a part of this time and its magnificent outcome, is our greatest honor. In Energy Radiance workshops Jaculin uses the same principles and techniques she uses to physically to teach you how to see energetically. Jaculin has been in alternative health care for over 40 years. She and her husband practiced alternative health care in Boca Raton and Delray Beach, Florida, for 20 of those years. She is also the mother of a Star Child. Her focus is on self-care, especially on an energetic level. Purchase your in-person or remote session today! The Chakra Therapy System was designed and given to Patrick and I in 1993 as our new service to humankind. In our health care practice our main goal was to educate people to know that it takes more than a pill to heal. We taught techniques to take control of your energy and move the body into health. It has always been easy for me to see the energetic world and a challenge to comprehend the solid world. As a child I would talk to the Celestials about the “lights” on people and they would teach me what these lights of energy were saying about a person. Many of the techniques taught to me by the Celestials are included in Energy Radiance, and I love to teach others how to play in energy. Our primary focus has always been to help people help themselves. After selling our health care practice, Patrick and I asked for a tool that would empower and demonstrate the ability to self- heal. The Celestials and Devic energies wanted a tool that would also bring us into our true purpose, to be the rainbow bridge that spans from heaven into the earth we reside upon. For three months there was a particular deva whom would watch me, but say nothing. I was raised knowing the protocol with the spirits of nature and would smile and say nothing. Finally, one day this being approached me and agreed to lead a team that was comprised of several nature spirits from different realms and many types of celestials. Our new journey had begun and we were honored to take on the task. Patrick made the first boxes in a 9×12 shed in our back yard in New Mexico. 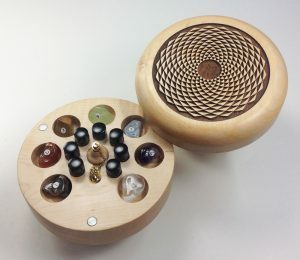 The details of the matrix field started out as a single, simple configuration built into an oak box. 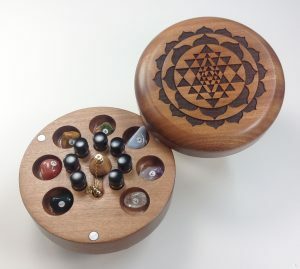 I would listen carefully to their instructions, writing down every detail, including the configuration of twelve chakras within a seven-chakra system built into the matrix inside of the wooden box. I would make the oils and go through a process of fine-tuning the formulas. Each chakra oil is comprised of several essential oils that are mixed in a certain sequence and time frame. There were many sessions with our instructors until finally we were given the approval for the first Chakra Therapy System. As the consciousness of humanity increased the Celestials would ask us to make changes. The Premium system now had two energy systems, the original matrix in the bottom of the box and an addition frequency coil in the top. This change created a perpetual energy field that broadcasted into the space where the chakras system was, creating a harmonious space. It also doubled the energy field, making it more powerful and giving faster results. The Celestials and Devas now asked us to instruct people to clear their internal organs and structural systems after their chakras were open to promote health. This breaks up any energy blocks and restores energy that has been disrupted. Patrick continued to get creative in the design of the wooden box and the oils went through several upgrades, keeping up with the increase in collective consciousness. When he presented the new round version of the box, they looked at him, then at the box, then at me, winked at me, looked at Patrick and smiled. Then they explained how much different this design would be. The matrix and frequency fields are twice as large in the round design, tripling the vibration and bringing it into a fuller, more resonate harmony with the earth. This increased the magnitude of the perceptual energy field and its broadcasting ability, but most of all it would develop the additional five chakras that are configured inside the matrix, rapidly. This is now our sixteenth year as the stewards of the Chakra Therapy System and we still get winks and smiles from the Celestials and Devas, and we still love our service to humankind. Chakra Therapy Systems can be found all over the world and one of the most fulfilling parts of this service is hearing how The Chakra Therapy Systems has helped others. Patrick and I hear so many wonderful stories as we travel around the country. If you have a story you would like to share, please write us about it. Thank you for sharing in this journey.